Iran’s media carried news on Wednesday of more Iranian casualties in the Syrian conflict, amid Tehran’s intervention with ground forces alongside Russian airstrikes in support of regime offensives. The latest victims were Second Lieutenant Moslem Nasr of the Revolutionary Guards’ 33rd al-Mahdi Airborne Brigade, killed near Aleppo, and Mehdi Kaeini. The deaths of two Afghans in Iranian-led units were also reported. 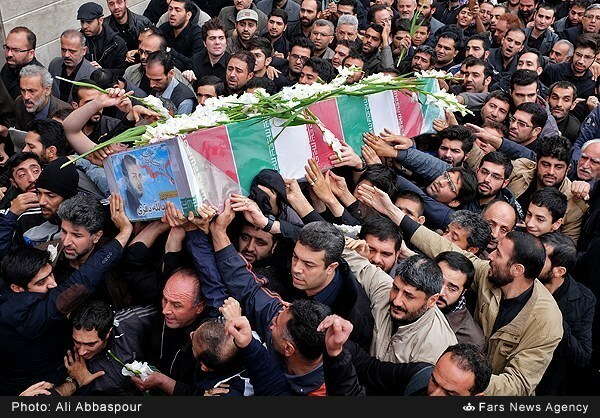 Meanwhile, other slain Iranian soldiers were buried yesterday. 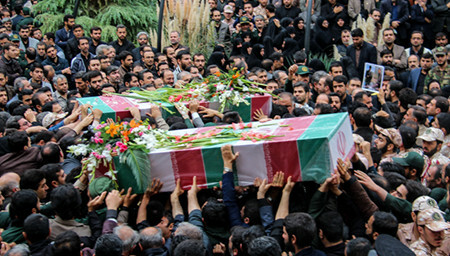 Former President Mahmoud Ahmadinejad, Deputy Speaker of Parliament Speaker Hojjat ol Eslam Mohammad Hassan Aboutorabi Fard, and President Rouhani’s Chief of Staff Mohammad Nahavandian were among the mourners for Revolutionary Guards members Abdollah Bagheri Neyraki and Amin Karimi. Both Neyraki and Karimi served in the Guards’ Ansar al-Mahdi Security Unit, which provides security for senior regime officials. Neyraki was one of Ahmadinejad’s bodyguards. Iranian forces have been in Syria since 2012, mainly as advisors, for logistics, or as commanders for the development of the National Defense Forces militia. However, Iran’s involvement — and the death toll — has soared in the Assad regime’s multi-front offensive in northwest Syria, which is also backed by Russian airstrikes, Hezbollah fighters, and Iraqi militia. One website tracking the deaths lists 29 casualties, including five commanders, since October 7. The list begins with General Hossein Hamedani, the overall Iranian commander in Syria, who was slain by the Islamic State near Aleppo three weeks ago. Seventeen of the deaths have been confirmed in the past week.